Revel in genuine joie de vivre on your vacation to France, with Adventures by Disney enabling your carefree enjoyment of this remarkable country. Tour magnificent locations that served as backdrops to history as well as inspired great artistic and literary masterpieces, culinary excellence and romance! Feel as if you're walking through a masterpiece painted by one of the greatest impressionistic painters, Claude Monet. Enjoy a guided tour of the artist's home and stunning gardens in picturesque Giverny, the inspiration for some of his most famous paintings. 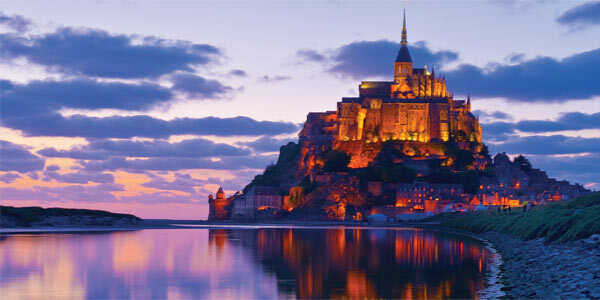 Visit the medieval monastery that sits atop this breathtaking tidal island. Explore the fascinating corridors and hallways of its ossuary, abbey, scriptorium and much more! Visit the renowned beach where the Allied Forces secured victory in World War II and take a privately guided tour of the Normandy American Cemetery. Visit Château de Vaux-le-Vicomte, which was built centuries ago by the same painter, architect and gardener who created the Château de Versailles. With spectacular gardens and abundant works of art, it is considered by many to be the most beautiful château in France. Visit the museum in the Tuileries Gardens that houses some of the most famous impressionist and post-impressionist paintings in the world. Here, you can see Monet's famous "Water Lilies" painting, inspired by the gardens he created at his Giverny estate. Bienvenue! An Adventures by Disney representative welcomes you at Charles de Gaulle International Airport and assists you with your luggage before you are driven to your hotel. After your Adventure Guide checks you in, settle into classic Parisian luxury at this elegant hotel in the Opera quarter, near Paris' famous department stores and renowned sights. If you arrive in the morning, feel free to indulge in déjeuner at the hotel restaurant or ask your Adventure Guides for lunch recommendations. Gather with your fellow Adventurers for a welcome reception and dinner at the hotel. Satisfy your appetite with a delicious meal of local and regional French cuisine as you sip world-famous wine. Wake up to a delicious breakfast before you begin your exciting day of adventure. After breakfast, hop onboard a motor coach for a panoramic tour of The City of Light, highlighting Paris's iconic architectural landmarks. Enjoy a chance to capture the moment in photos when you stop at the Trocadero. See impressionist and post-impressionist paintings at this extraordinary museum of art, located in the west corner of the Tuileries Gardens. It contains works of some of the most renowned artists in the world, including Claude Monet, Henri Matisse, Paul Cézanne, Pablo Picasso, Pierre-Auguste Renoir, Amedeo Modigliani and Henri Rousseau, among others. Enjoy a relaxing moment over a delicious French lunch. Take a scenic trip to Giverny to visit the home of this great Impressionist painter. Discover his sources of inspiration in tranquil gardens bursting with vibrant blossoms, luxurious, leafy trees and ponds adorned with water lilies. Take the coach to the grand hotel in Normandy that will be your home for the next 3 nights: the Royal Barrière Hotel. This majestic gem crowns the prestigious beach of Deauville, a refined getaway that offers a quiet ambiance for discerning travelers. Enjoy delicious traditional cuisine in a beautiful setting in this fine restaurant housed in the elegant Hotel Normandy. Fuel up on a satisfying breakfast at the hotel before boarding the coach for a trip to awe-inspiring, unforgettable Mont Saint-Michel. As your coach approaches, be awestruck by the silhouette of this formidable island fortress and the looming monastery at its core. Surrounded by a venerable town, this medieval Benedictine abbey was built in honor of the Archangel Michael who, according to medieval legend, will slay the dragon at the Apocalypse. With a local guide, explore rooms such as the ancient scriptorium, ossuary, chapel and crypt. Feel the island's enchantment as you wander down winding cobblestone streets on your own trek through town. Feast on world-famous omelets and other regional favorites at this quaint, historic restaurant that proves why French cuisine is très magnifique! Spend time wandering the rambling cobblestone streets to discover shops and curiosities galore or visit the cloisters for their vertiginous views. Return to Deauville, known as the "lady of the French coast," to enjoy its stylish restaurants and bustling nightlife. Explore this upscale resort town before enjoying le dîner. If you need restaurant recommendations, your Adventure Guides can help find the perfect meal for your family. Begin your day with a delicious breakfast at the hotel. Travel to nearby Bayeux to see the astonishing Bayeux Tapestry—a 224-foot (68-meter) embroidered cloth that tells the story of the Norman conquest of England in 1066. 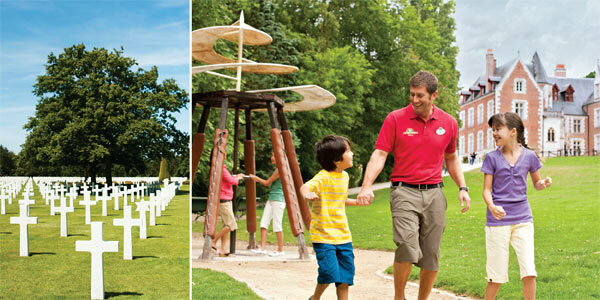 Ride the coach to Omaha Beach where the United States 1st Division landed on D-Day to secure victory in World War II. The story of the invasion and its costs come to life on a privately guided tour of the area, including the Normandy American Cemetery. Back in Deauville, indulge your inner boulevardier as you stroll past romantic Belle Époque villas on the beachfront boardwalk of this suave seaside resort. A year-round playground for the French elite, Deauville is abuzz with film festivals, regattas, golf tournaments, jazz—and world-famous thoroughbred racing at the Hippodrome. Unwind and enjoy dinner with your fellow Adventurers at the Royal Barrière Hotel while Junior Adventurers attend a private dinner of their own. End the day curled up with your petits when you are treated to a private showing of a Disney movie. Enjoy a delicious breakfast before you begin your exploration of Honfleur. On the way back to Paris, stop at this estate containing a château and gardens that are considered among the most spectacular in France. Bought by Nicolas Fouquet in 1641, the Château de Vaux-le-Vicomte took a 20-year collaboration of an architect, painter and landscape gardener to be transformed into a veritable testament to harmonious beauty. Back in the City of Light, dine on elegant French fare at your leisure at one of its remarkable restaurants. Delicieux! *The Farmers Market is open on Wednesdays only. Start off your day with a delicious breakfast and get ready to view some of the greatest artistic masterpieces in the world. Be awestruck by the art you view in a privately guided tour of the Louvre Museum. Enjoy wine tasting in a private area of the Museum and share your impressions of these masterpieces with fellow Adventurers. Spend the entire afternoon as you wish—shopping, sightseeing or simply watching passersby at a charming sidewalk café. Enjoy a superb feast in a historic location and share memories of your France adventure with your fellow Adventurers before you bid them a fond farewell. Bid your fellow Adventurers a bon voyage at your last breakfast in Paris. What better way to celebrate French culture than by learning how to prepare classic French dishes yourself? In a private cooking class, you'll do exactly that! Afterward, sit down and enjoy the fruits of your labor for lunch with your fellow Adventurers. Board pre-arranged transportation to the airport and say au revoir—until you return again!